Alsace has loads of robust, rib-sticking, flavour-packed dishes that are just right for winter days. 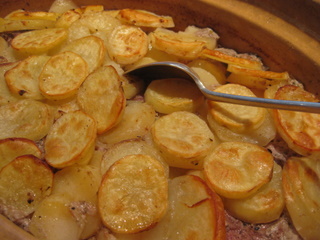 Baeckeoffe, a one-pot meal that combines pork, beef, lamb and vegetables marinated in the region’s famously fragrant white wine, is one of the best. The name of this classic Alsatian dish pulls together two dialect words: Baecke, the bakery and Offe, the oven. In the old days, ovens in private homes were an undreamed-of luxury – not to mention an unwelcome fire hazard (which explains why, if they existed at all, they were always stuck on the outside wall of the house, connected to the kitchen by a little iron door). Small, simple dishes were done in a pan on top of the stove. Larger items requiring all-round heat were prepped at home, then taken round to the village baker’s to be cooked in the wood-fired oven after the bread had had its turn. The usual story that’s faithfully trotted out is that Baeckeoffe was a Monday morning wash-day dish, outsourced to the village baker so the housewife-cook could get on with the household chores. But this seems pretty unlikely to me (and to plenty of others) – Monday lunch would surely be an occasion for recycling the remains of a Sunday lunch feast, leftover choucroute and bacon or ham for a choucroute quiche, for example. A more plausible version, subscribed to by chef Jean-Georges Vongerichten, a native Alsatian, was that Baeckeoffe was a festive Sunday dish. He has happy childhood memories of taking the big pottery dish to the bakery on the way to Sunday morning Mass. At the conclusion of the service, the dish was retrieved and taken back home for lunch. But whatever the true story behind this wondrous winter concoction, it’s a dish that’s firmly rooted in Alsace tradition. Picture the scene, in a small, cosy, wood-panelled inn somewhere on the Route des Vins (the Caveau Morakopf in Niedermorschwihr, for example). The tables are decked with rich red-patterned tablecloths decorated with vine leaf motifs from Beauvillé. 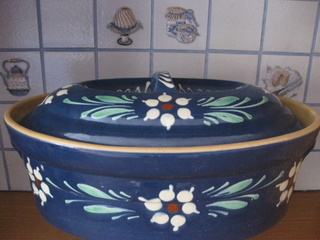 On the sideboard is a collection of classic, decorated pottery terrines and Baeckeoffe dishes. Napkins are unfurled, orders are taken, and a small jug of refreshing Sylvaner or Pinot Blanc is brought to whet the whistle and ease the pain of waiting. In due course the stout chef-patron, clad in his whites, emerges backwards through the swing doors, swirls around in a neat pirouette and sets the immense decorated pottery dish down on the table with a satisfying thud. Carefully he chips and prises away at the band of dough that seals the gap between lid and dish. The whole table leans forward in eager anticipation, the lid comes off and there’s a collective intake of breath as some of the finest flavours and fragrances of Alsace are released: pork, lamb, beef, root vegetables, juniper berries and Riesling, all marinated together for days and baked to a state of gentle perfection. A thoroughly good-natured winter dish, which you can time to your convenience: it needs 1-3 days’ marinating followed by several hours in the oven left to its own devices. For the meat, go for so-called inferior, i.e. 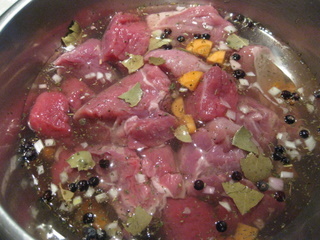 slightly fatty, cuts which will stay nice and moist (pork neck, shoulder of lamb, a stewing cut of beef), and cut all the meat in quite large pieces so it doesn’t dry out in the long, slow cooking. As for the wine, any Alsace Riesling will do, as long as it’s a dry one, and preferably not outrageously expensive – an entry-level wine from one of the grand domaines like Trimbach, Hugel or Beyer would be perfect. (Keep the Clos Ste Hune for drinking with the meal.) 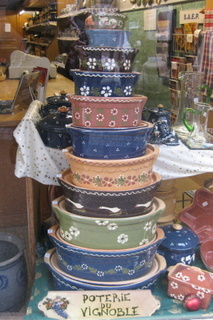 The ideal container is a large, lidded ovenproof ceramic pot, best of all one of the Soufflenheim ones like in the pic. Once you’ve assembled the Baeckeoffe and put it in the oven, you can set out for a long walk to work up an appetite. On your return the kitchen will be filled with wondrous aromas of Alsace. Serve with green salad and plenty of bread to mop up the (unthickened) juices. Any leftovers can be reheated – like many dishes of this kind, it’s almost better next time around. Previous: Previous post: Alsace Wines – Dry, Off-dry, Semi-sweet or Sweet?